This site-specific exhibition at Jendela (Visual Arts Space) explores transitional spaces in the city and one’s relationship with the environment, with oneself, and with others. “Jendela” stems from the Malay word for “window”, and is so named due to its distinctive louvred windows. An Other Space《另·外·空間》consists of constructed rooms with real and unreal windows extending throughout the space, and plays with the idea of windows opening into a duality of spaces: inside versus outside; private versus public, and reality versus illusion. 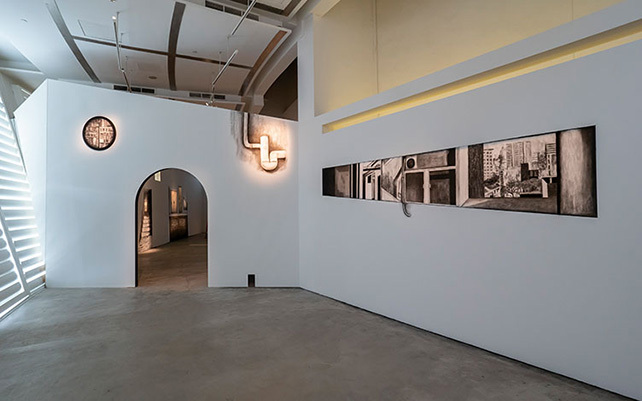 Tang demarcates spaces in the rooms with light and shadows using artificial lighting within the gallery and natural light that seeps through the louvred windows, along with charcoal drawings on the walls. Walking through the space, viewers can experience the convergence of the real and the imaginary, and are invited to contemplate their memories of different places in the city they live in and their personal relationships with them.